Once upon a time, people knew their neighbors. They talked to them, had cook-outs with them, and went to church with them. In our time of unprecedented mobility and increasing isolationism, it's hard to make lasting connections with those who live right outside our front door. We have hundreds of "friends" through online social networking, but we often don't even know the full name of the person who lives right next door. This unique and inspiring book asks the question: What is the most loving thing I can do for the people who live on my street or in my apartment building? Through compelling true stories of lives impacted, the authors show readers how to create genuine friendships with the people who live in closest proximity to them. Discussion questions at the end of each chapter make this book perfect for small groups or individual study. About "The Art of Neighboring: Small Steps to Building Genuine Relationships Right Outside Your Door"
Jay Pathak is senior pastor of the Mile High Vineyard, located in a suburb northwest of Denver, Colorado. He also serves as the regional church-planting coordinator for the Rocky Mountain region of the Vineyard. Dave Runyon is the community development pastor at Foothills Community Church in Arvada, Colorado. In 2009 he led a neighboring movement that mobilized over 20 churches and 15,000 people. 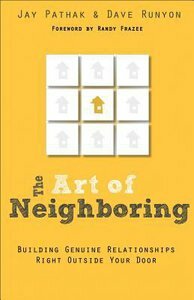 Customer Reviews For "The Art of Neighboring: Small Steps to Building Genuine Relationships Right Outside Your Door"
An invaluable practical and resourceful help to actually loving, your actual neighbour. I read this at the same time I did Tim Chester's 'A meal with Jesus' and I must say, the heart behind both complements each other well! Have a read and you'll likely agree if you take up the challenge to - love your neighbour.